Rep. Pat Tiberi (R-OH) resigned to return to the private sector that triggered tonight’s special election. Democrats weren’t even supposed to be competitive here. Instead, we got a nail-biter of a race that saw Democrat Danny O’Connor, who serves as Franklin County’s Recorder, give state Sen. Troy Balderson and the Republican Party quite the challenge in a congressional district that Trump won by double-digits. This special election in the 12thcongressional district is the last contest until the 2018 midterms, where Democratic enthusiasm is through the roof. It’s a bellwether, one the Democrats see as a sign of a blue wave if they win or come very close. Whoever wins will have to defend their seat again this November. While this cycle is loaded with nuance, there are troubling signs that the GOP could potentially lose the House. There’s still a lot of time to go, however. An RNC official told Townhall that the committee mobilized 800 volunteers, who had at least one million voter contacts during this special election. While the liberal media might be lusting for a blue wave and take pleasure in pushing stories about GOP destruction in the fall, the RNC has been on the ground there since 2017, longer in other states. They’re set to match voter contact totals from the 2016 election; Democrats are not even near their similar figures for that cycle. With Ohio being a key swing state, the RNC never left after Trump trounced Hillary there two years ago. They’ve established two offices in the 12thcongressional district, and spent close to $650,000 on this race. The RNC, NRCC, Ohio GOP, and other groups “went all-in” for this race—and it looks like those efforts paid off. "Today, the voters of Ohio’s 12th District elected a true conservative committed to pro-growth policies that have already brought new jobs and economic confidence to the state under President Trump’s leadership," said RNC chairwoman Ronna McDaniel in a statement. "Voters are tired of Democrats’ message of resist and obstruct, and Danny O’Connor’s empty campaign rhetoric was no exception. 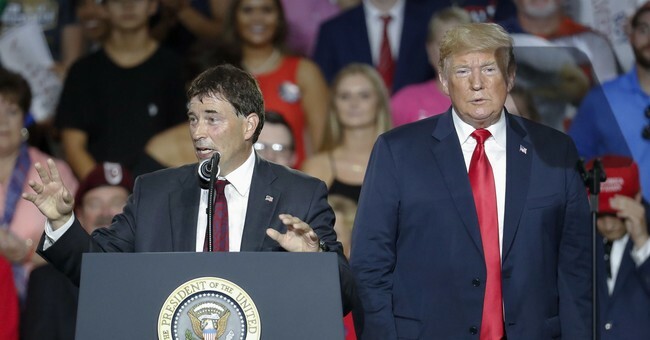 With President Trump’s support that helped lead him to victory, Troy Balderson's win tonight is another example of the so-called 'blue wave' being nothing but a ripple." Most polling for both parties has shown a slim advantage for Mr. Balderson, 56, an auto dealer-turned-state legislator with a wooden public demeanor. But Republicans see his position as precarious in a season when Democrats are voting with passionate enthusiasm. And Democratic attacks on Mr. Balderson — for telling a newspaper, The Columbus Dispatch, that he might support raising the eligibility age for Social Security and Medicare — have wounded him. Republicans appear sensitive to Mr. Trump’s limitations even in a right-of-center area like the 12th District. Besides attack ads, the Congressional Leadership Fund is also airing commercials showing Gov. John Kasich, one of Mr. Trump’s most implacable Republican critics, praising Mr. Balderson. The message, aimed at white-collar centrists, was late in arriving: Mr. Kasich waited weeks to endorse Mr. Balderson, despite urgent pleas from Republicans including Representative Steve Stivers, an Ohioan who chairs the National Republican Congressional Committee. Mr. O’Connor, the Democrat, has attempted to channel a nonthreatening kind of indignation, trumpeting broadly appealing themes like protecting government-backed retirement benefits, rejecting corporate donations and promoting “new leadership” in Washington. Mr. O’Connor’s campaign has projected an air of defiance, tinged with amusement, at the onslaught against him. One wall of his headquarters, in a converted clothing store in Columbus, is collaged with brutally negative Republican campaign mail: Two mail pieces show images of armored police officers, with text claiming Mr. O’Connor, who favors stricter gun regulation, supports seizing legal firearms. Another depicts Mr. O’Connor hanging from marionette strings held by Ms. Pelosi. Echoing Representative Conor Lamb, the upset winner of a March special election near Pittsburgh, Mr. O’Connor vowed early not to support Ms. Pelosi. He said in an interview that, by focusing on her, Republicans signaled their own weakness. And that’s the troubling part: the GOP does have a lot to brag about this cycle. Unemployment at an 18-year low, more jobs than job seekers, three million jobs created, the largest boost in worker pay in a decade, bonus checks to three million working class families, consumer and small business confidence at record highs—all of this thanks to the Trump tax cuts. The economy is booming; second quarter growth was four percent. It seems the GOP isn’t pushing this aggressively enough. Yes, make fun of Pelosi, Maxine Waters, and the rest of the loony toon progressive wing of America, but also show that the Trump agenda has helped America’s economy. One way to kill that is by electing more Democrats to Congress. They’re the anti-economy party—and the window to make that case is rapidly closing. Also, O'Connor did say he would support Pelosi. Rural turnout in key GOP areas was weak, very weak—but it seems Mr. Balderson will eek out a win. So, it seems the GOP will hold the line, albeit just barely. Breaking: all precincts are reporting in Marion Co. (smallest, most R county). Good news for Balderson (R): he won it 68%-31%. But the bad news for him: it's at only 41% of '16 turnout, which is *really* weak turnout there if those numbers are final. Delaware is really the big question. Historically, this is a very GOP county. The early vote was also really strong for O'Connor. One possibility, a ton of GOP left. The other: O'Connor will outperform in a well-educated area. Just can't say yet. Maybe I like Balderson's chances a bit as of now? Hard to say without knowing which precincts are in. UPDATE: It’s not been called officially, but Balderson appears to have clinched victory. Cook Political Report’s David Wasserman called it for Balderson, with FiveThirtyEight’s Nate Silver saying that even if a recount is triggered due to provisional ballots, Balderson still comes out on top. President Donald J. Trump, who flew into Ohio over the weekend to stump for Balderson, declared victory, noting how his pit stop helped seal the deal and he hopes Balderson wins big again in three months. Meanwhile, there seems to be a debate as to whether Trump or Gov. Kasich’s support helped secure Balderson’s win. We’re going to hear a lot of crap from the Left about how this is a moral victory. That even though they lost, they won. And folks, this is why moral victories are total crap. It’s just a way to take the sting of a loss away. Moral victories are an exercise in moving goal posts. Not that you don’t already do this, but when CNN, MSNBC, and other liberal outlets wallow in moral victories 101, switch off the channel. Projection: Troy Balderson (R) defeats Danny O'Connor (D) in #OH12 special, barring a tabulation error/provisionals we don't know about. GOP source tells me Trump was the “difference maker” for Balderson by coming to the state over the weekend.